Hot on the heels of yesterday’s ‘Ingredient’ which looked at Energy Descent Action Plans, here is a detailed and fascinating review of the Totnes one by Michelle Colussi, from i4 magazine. It offers some excellent insights and well informed commentary on the Plan, and argues that it should really be thought of as an ‘Invitation’ rather than a Plan. The Totnes EDAP is still available here. You can download the pdf. of this article (beautifully illustrated) here. Our thanks for their permission to reproduce. 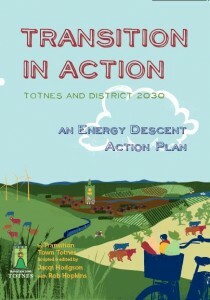 The Transition Totnes Energy Descent Plan. By Michelle Colussi. The Transition Town model is a series of steps or ingredients for engaging a whole community in the process of reducing reliance on fossil fuels. The model assumes that life with less oil is inevitable, and that making the changes required is up to us – to you and me. It also assumes that everyone needs to be part of the solution. Residents of Totnes, England first developed the model in about 2005. Today, close to 500 communities around the world have adopted it and are recognized as “Transition Towns.” An international Transition Network has formed to connect these initiatives and support training related to the model. You might say that the purpose of Transition Towns is to build a community’s awareness, knowledge, engagement, relationships, and tools such that it can complete a multi-sector, comprehensive Energy Descent Action Plan (EDAP) and have the capacity to implement it. The EDAP presents a long-term vision of life with less oil in major sectors of community life, and then identifies the incremental steps required to get there. What does the plan include? What components will support the efforts of citizens, organizations, and institutions to reduce carbon emissions and reliance on oil? When is the right time to start? How do we know when we are ready? How do we start? What do we do so every sector in our community helps imagine a way of life with less fossil fuels and the steps to making that vision a reality? 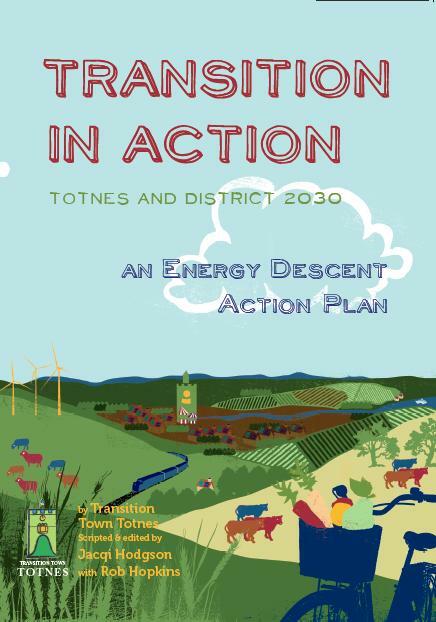 This spring, Totnes published their EDAP: Transition in Action – Totnes and District 2030, an energy descent action plan. Running at over 200 pages, it sheds some light on these questions. If your Transition Town is wondering how to organize and carry out an EDAP process of its own, Transition in Action is a great place to start. When Did They Start and Finish? The members of Transition Totnes started to plan their EDAP process in early 2008, about two years after formally launching (or “unleashing”) their initiative. The EDAP process was announced publicly that September. In April 2009 a university conducted an extensive survey of 220 households to support the planning process and to provide some baseline data. They had a full time co-ordinator organizing a wide variety of events that engaged about 500 people in the EDAP process. … then you are likely ready to start planning your EDAP process. 1. Define the scope, gather resources, and research. What is the community’s geographical area? Totnes defined its area as Totnes and District, which includes another 15 hamlets and a total population of about 24,000.The total land area is 24,000 ha., just over 19,000 of which is agricultural land. Totnes itself is a market town of about 8,000 people. Choosing a geographic area that aligns with existing political boundaries makes it easier to use existing statistics. What is the timeframe? Transition Totnes chose 2030 as the target – or roughly 20 years from now. Design a process of citizen engagement that builds on the Transition group’s awareness-raising activities to date. Develop tools. Transition Totnes used a 10-meter Transition Timeline at every event. People added their ideas using post-it-notes. A postcard and a flyer depicted artist’s conceptions of local scenes in 2030. Large, light poster boards described the EDAP process itself and were portable to any kind of event. 4. Public Launch with speeches, art, theatre, and an introduction to the timeline. 5. Public Workshops. Two workshop series were designed using the Totnes Working Group topics or sectors. The first series asked citizens to consider their assumptions about the drivers of change and the changes they imagined that they could influence in the future. Then they considered future scenarios. What would “Business as Usual” look like, versus “Willing and Able to Change”? Cross-cutting principles emerged from these discussions that outlined the approach to the future for each sector or theme. The workshop ended with a guided visioning and key words posted from that experience. Grounding the discussion and input around a common understanding of assumptions seems important to me. The second series started with the principles (or “strategic themes”) and visions from the first workshop and asked participants to consider the actions and plans that would get them there (”back-casting” over time from 2030 to today). “Back-casting” is the process of moving in time backwards, from a vision of the future to the present day. Participants consider the steps or visible results that would lead up to the vision. For example, if we have a vision for transportation in our community in 2030, we might start by describing that future, then back-cast to imagine the milestones we would pass on the way there. When would the downtown be reserved to foot traffic only? How might lobby groups help make that happen? How would bike sales and bike storage change over this time? What might employers do to encourage car sharing or public transit? For more information see the video on back-casting at www.localeyes.org. From this process it is clear that, to build a vision for the future, citizens need to understand where they have been, and look at what they can change and what they can’t. Their visions then are not fantasies. Instead, they are grounded in knowledge about the past and present situation, as well as on an understanding of the citizens’ actual sphere of influence. The workshop designs would be valuable resources for any community beginning their own EDAP process. Open Houses were hosted to display input thus far around 15 themes and get more input. Schools participated. A 2030 Cabaret Night was held where participants had fun generating music, poems, and art that described strategic themes of this future community. Discussion groups were held on all the themes where additional back-casting was conducted. Totnes’ Draft Plan described key themes for each sector and some very general “Pathways” (actions) over time. The Transition Working Groups were the first round of feedback and then it went more publicly. Drafting the EDAP was apparently done by staff. The Working Groups (and other stakeholders, it sounds like) then reviewed the draft. Some Working Groups also took on significant roles in research and writing for sections related to their work. Implementing the plan is not really addressed. What Does Transition in Action Tell Us? Transition in Action is best described as a story or series of stories. The stories (say about food, or about transportation) are non-fiction, historical and present day tales. They walk us smack into a fantasy (or vision) about the future. So the reader is not at all surprised to find him or herself in the Pathway for 2020 or any other future year. Here’s how they do it. The context, or our current socio-economic situation and how Peak Oil and Climate Change are affecting it, is described in chapters 1, “Where We Start From.” and 2, “Creating a New Story.” These chapters also cover major developments in response to those issues: UK government policies, global events and policies, localization, and resilience. To help tell the story of Totnes and area to date, there are photos that show changes over time as well as quotes from elders about the past. Transition Totnes is introduced as part of this story. Finally, they introduce the EDAP process as a way of drawing the reader into the future. “Joined Up Thinking” introduces the 2030 overall vision and timeline activities or outcomes for each year that are illustrative of more complex systems changes. “Working with Nature” concerns food security, farming and food production, health and well-being, water and biodiversity. “Creative Energy Systems” concerns Totnes Renewable Energy Budget, transportation, building, and housing. “Resourcing Localization” concerns economics and livelihoods, consumption, and waste. “Nurturing Transition” is all about the arts, culture, media and innovation, inner transition, education, awareness and skills. “Empowering People” concerns local governance, community matters, and youth issues. It’s Magnificent – but is it a Plan? Transition in Action is a huge contribution to our collective understanding of what an EDAP is, and how to go about building one. Kudos once again to Totnes for its pioneering efforts and generosity in sharing them with the rest of us. The EDAP tells a very compelling story about food, energy, transportation, and the economy in Totnes and District in the past, today, and twenty years from now. There is no doubt this document will contribute to ongoing reflection, learning, innovation, and best practice around energy descent planning. The public workshop process, the principles and methods for plotting activities on the timeline, and the use of “Joined Up Thinking” when describing the complexity of inter-connections across sectors – all these are all very useful. I have much better questions now about developing an EDAP than I did before. In particular, there are two things I think Transition Towns need to know more about. First, I would like to know more about the construction of the pathways. You can imagine what a task it was to take every idea and result from public workshops and open houses and arrange them in one or more logical Pathways toward the 2030 visions. There must have been moments where the authors struggled with “what comes first” and “what is doable.” Transition in Action lists the principles that guided this process of sequencing and clustering ideas, generally from the simple to the more complex, from individual to collective, from awareness to engagement, and finally to giving back to society (see below). Awareness, education, gather information – take simple actions. Education, make plans for change – take more informed actions. Engagement – invest time in more involved actions, lifestyle changes. Foster links – share ideas, skills. Form groups and act together. Empowerment – nurture citizenship, think and act strategically. Strive for “joined up” thinking – be open to creative ideas. Greater equity and life balance – work with others to share hope, resources. Give something back to society – share and nurture others who need support. I imagine teams of people taking on different topics or sections and sorting and clustering ideas using these principles. I imagine a lot more sticky notes and a great deal of discussion – maybe even debate. How did they decide “what” would happen and then “who” would make it happen? Were some of the public’s ideas left out? Transition Towns that are giving serious thought to completing an EDAP need this level of information about the process. I hope Transition Totnes shares it sometime soon. Second, there is nothing in the document that speaks to current or future organizational and institutional capacity in each sector. Many pathways make reference to King Edward VI Community College (KEVICC) and to Totnes Council, for example. It is not clear however if these groups have committed to take action around the specified outcome. Are they allocating resources for the work? Or is this commitment yet to be finalized? Who will do that? There is no reference anywhere to the role of the Transition Totnes Working Groups either. Are there areas for which there is no leadership or organizational capacity? If so, it is not mentioned. Informal and formal groups, organizations, and institutions are key to a great deal of the work in our communities. I can’t imagine talking about healthcare or energy, for example, without talking about organizational mandates, resources, and collaboration as a key consideration. (In a lot of towns that I know it would be political suicide not to name all the actors.) “Community/Organizational Capacity” should have been a heading under each topic. In fairness, it could be that this analysis exists but has not been included in this public document. It could also be that every group or organization or business that is named has made a commitment to taking that action. If that is the case, it is another step that should have been described. How did they get agreement and buy-in from the many organizations that are named in the plan? For lack of this clarity about who will do what and how, the Pathways are not really an action plan in any sense that I understand the term. They create a vivid picture of the future from now to 2030. Readers will see immediately that to achieve most of the results specified in each Pathway on schedule will require significant resources over several years. Again, it could be that these detailed plans exist for the current or following year and simply have not been published. In short, as impressive a document as Transition In Action is, it falls short of being an Energy Descent Action Plan. Instead, it seems to be more of a vision – a remarkably explicit, exciting, and community-based vision that tells us exactly what is to come about, but not how or by whom. Ultimately, the document acts like more of an Energy Descent Invitation, than a Plan. It entices other communities to have a go at the process for themselves. Given the time and resources that an EDAP will require, will this invitation be compelling enough? A staff member of the Canadian Centre for Community Renewal (CCCR), MICHELLE COLUSSI is a certified facilitator of the “Training for Transition” workshop, a member of Transition Victoria, and is very active in building the Transition Town Training network in Canada. She is also a member of the Canadian CED Network (CCEDNet). Reach her at 250-595-8874 or mcolussi@telus.net. i4 is an ejournal about Inspiring, Innovating, Inciting, and Inventing ways of life and work that sustain both people and planet in this century of unprecedented challenges. i4 is a publication of the Canadian Centre for Community Renewal.